In this week’s edition, we recap how bitcoin ended the first half of 2018, which is now down close to 60% from its price at the beginning of the year. We review some of the potential reasons behind its inability to break the down trend, highlight remarks by some of the optimists who continue to hold out hope for a spectacular rebound, and review some of the good news that managed to come out of last week’s bleakness. We also detail Facebook’s evolution on its stance toward cryptocurrency-related advertisements and discuss potential reasons why its had a change of heart with feelings about the blockchain. The price of bitcoin plummeted below its previous 2018 low set last week, sinking to $5791 on Saturday before jumping back up to over $6300 less than 24 hours later. Even though the price rebound occurred on relatively weak volume, semblances of stability are welcome news to late-comer investors who have all but given up hope on bitcoin. While crypto markets across the board are marked far and wide as at a “low point,” resembling the aftermath of the dotcom bubble burst of the early 2000s, it is worth taking into consideration that the entire market capitalization of all coins is still up 70% since this time last year, which is quite significant for any market dominated by professional traders. In comparison, the S&P500, an index of 500 stocks of leading companies in corporation, is up a mere 12% over the same time period. Nevertheless, many analysts touted by the media continue to hold extremely optimistic expectations for bitcoin’s continued ascent. Co-founder of derivates trading exchange Bitmex Arthur Hayes predicts a $50,000 price tag for bitcoin by the year’s end, for example, and with Bitmex currently doing $1.34 billion in BTC trading volume per day, his words should not necessarily be taken lightly. An economic advisor at financial services company Allianz, Mohammed El-Erian, also made the news over the week by proclaiming bitcoin was a solid “buy” opportunity if prices sank close to the $5000 level. At the other end of the spectrum and giving balance to bullish expectations that seem to dominate the news headlines was an opinion piece in the Independent U.K. which proclaimed that, because of bitcoin’s precipitous drop throughout the first half of 2018, it would go the opposite direction and “will probably be totally wiped out” in the next couple of years. 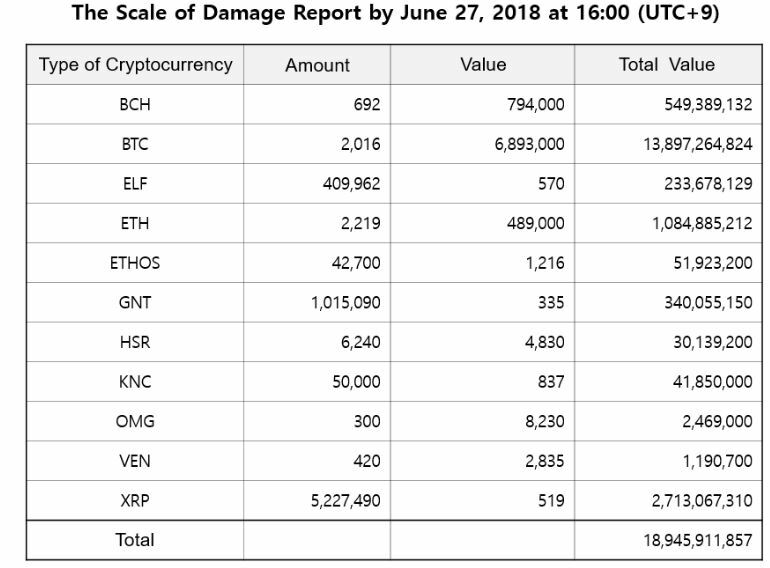 Some good news to come out of the world of bitcoin last week was the announcement that hacked exchange Bithumb had recovered nearly half of all coins lost in the attack the week before. To thank was an enhanced amount of cooperation between major exchanges who helped the Korean exchange trace coins stolen from its account. Unlike with many other hacks of this degree (some $14 million in funds still remains at large out of the $31 million total), Bithumb has pledged a full reimbursement of lost coins to its customers, and trading has resumed on the exchange as normal. One of the largest exchanges in the world, and the second largest in Korea, Bithumb lists 37 coins for trading and has a volume of about $131 million in trades every 24 hours. The government of South Korea has had an interesting relationship with cryptocurrency over the years, one of the few national bodies to both heavily regulate and embrace blockchain technology at the same time. In July 2017, they became one of the first countries to legalize bitcoin as a method of remittance, meaning workers could opt to have a portion of their salary paid in bitcoin (up to $20,000 per pay period). Behind the U.S. and Japan, Korea is the 3rd biggest bitcoin trading market in the world, with 14% of all trades occurring within its borders. At the same time, anonymous trading has been banned and the country has implemented strict Know Your Customer (KYC) and Anti-Money Laundering (AML) policies in the licensing of its exchanges. The country of 51 million has big plans in 2018 for crypto, aiming to establish itself as a “blockchain haven” for companies in the industry worldwide. The majority of all ICOs were ending in abject failure, either due to the lack of production of a viable product, mismanagement of funds collected during the ICO process, or because of the fact that they were outright scams to begin with. This trend would undoubtedly attract additional government oversight and perhaps put Facebook in the position of being at fault for aiding in the promotion of fraudulent business. Facebook’s outright ban on any advertisement containing the word “cryptocurrency” was deemed largely unpopular as it was right on the heels of Telegram’s announcement that it planned to conduct the biggest ICO to date, which was ultimately successful and raised over $2 billion in development funds. Nevertheless, many advertisers found creative ways to skirt the ban, rendering Facebook’s efforts to enforce it somewhat superficial. Last week, the social media titan announced that it would loosen restrictions on crypto-oriented advertising, maintaining a ban on ICOs but allowing advertisements for cryptocurrency business whose products were already available to be hosted, so long as their application was approved by the advertising department. The transition in Facebook’s approach to crypto ads is speculated to be due to not only the idea that Facebook may be launching its own coin, but also because the amount of money to be made is simply too large to ignore, and by continuing to ignore it, Facebook might be missing out on a huge potential for revenue. Is Satoshi Nakamoto ready to come back into the public eye? A mysterious posting at a website titled nakamotofamilyfoundation.org is leading media sources to speculate that he is, though the seasoned crowd at bitcointalk (the original bitcoin forum, founded by Nakamoto himself), thinks otherwise. A flood in China is purported to have wiped a massive bitcoin mining operation, causing millions of dollars in damage and even having the effect of reducing the Bitcoin Network hash rate by 10-15% for a brief period of time. Which country hosts the biggest bitcoin “mining farms” in the world? It may be no surprise that the answer is indeed none other than China, which hosts 3 out of the 5 biggest mining pools in the world. The country of 1.38 billion has cheap energy and labor supplies, as well as a vast amount of open land at high altitudes, where tundra-like climates can vastly reduce costs associated with keeping mining equipment from overheating. In addition to its lax laws governing large-scale crypto gambling and investment operations, the tiny country of Malta is putting itself on the map as the world’s newest “blockchain island,” after its government passed 3 crypto-friendly bills which will make is easier for blockchain-related companies to conduct business there. American Rapper Akon – already largely invested in public works projects in different areas of Africa – announced he would be building a “crypto city” in the country of Senegal, where his own altcoin (to be called “Akoin”) would be the primary method of payment. Senegal is regarded as already in possession of an “excellent telecommunications infrastructure” which would make deployment of Akon’s idea all the more feasible. Cyrus McNally, thanks so much for the post.Really thank you! Keep writing.